On first sight, the Suzuki GSR 750 looks the part. The styling is all about lines that sweep down to the front wheel, minimalistic and functional. This is a machine that manages to show some serious intent before we’ve even got the keys into the ignition! The GSR’s origins are in the K5 Gixxer 750. Suzuki have used an iconic sports bike and given it the naked treatment. Some people will tell you that it’s a street fighter, but that does the machine a disservice. A street fighter suggests a motorcycle that was built in somebody’s shed after it had been crashed and frequently involves components from other crashed motorcycles. It suggests that no matter how lovingly restored, cleaned and polished it is, that when it is ridden around by someone whose riding style leaves us in no doubt whatsoever as to how the original crash took place. The GSR, on the other hand is a perfectly finished motorcycle. The legendary 750cc engine has been de-tuned by over 35 bhp from the original. This gives riding the bike a completely different characteristic. Sure, it’s brisk enough, but its acceleration is never going to panic a seasoned motorcyclist. The clocks are well laid out, simple but clever, with all the pertinent information on a digital readout and a nice clear tacho counting the revs. The chassis is only very slightly modified from the one used on the Gixxer, and, as such the wheelbase is nice and short. A combination of this and a set of traditional handlebars make changing direction on this simplicity itself. Combine this with some very well set up suspension and you have a machine that has real world usability in spades. And an ability toreach for the skies with incredible ease. The only thing I really didn’t like on this bike was the standard exhaust, but you can offset the look of the big bin hanging off the right hand side and keep the fashion police at bay by fitting stuff as tasty as an Akrapovic, which not only looks and sounds better, but will also release a few extra ponies. On the daily commute to the office, this machine was compliant, very easy in stop start traffic, narrow enough to filter, and subtle enough to let the rider away with those late-for-work shenanigans. While it coped with the commute well, struggling past lines of parked cars is a waste of a decent motorbike. The Sunday morning spin is where this thing showed its true colours. Thanks to putting the rider in a position where they sit just that little bit higher, the GSR quickly becomes a sports bike hunter-killer, with the combination of good handling and a great engine making it a whole lot of fun on the back roads. The GSR is indeed a very easy bike to ride hard, but manages to remain completely unthreatening. I can’t help but think that with some controls such as a limit to what gearing, engine modification and tyres could be used; this bike would make for one hell of a closed bike race set. I can just imagine 26 of these things all competing for the same bit of tarmac on the first corner of a race circuit. Maybe we’ll ask the boss? There are of course, plenty of competitors in this market, but do any of them have Gixxer 750 engines? 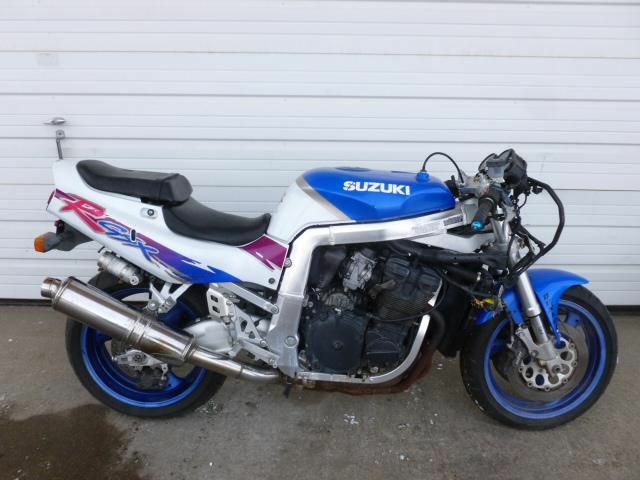 This entry was posted in articles and tagged raceway motorcycles, suzuki, suzuki GSR 750.